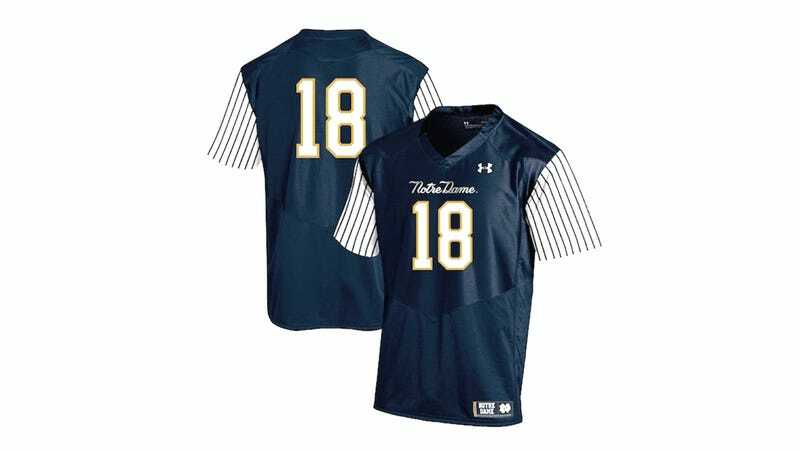 Notre Dame football will play at Yankee Stadium in November, so to commemorate what will surely be a memorable game against Syracuse, the Fighting Irish will wear these pinstriped uniforms. The price is quite steep at $95, but anyone who’d buy one would be doing so drunk anyway. The sleeves and cursive script are a little reference to the New York Yankees, that historic baseball team currently 10 games back in the AL East. Do you get it? Match it with some Lakers shorts and a Manchester United hat for the look of 2006's worst sports fan, who’s physically incapable of keeping his mouth closed when he’s not talking. Also, the players won’t be wearing gold helmets. Whatever.